One of the comments we get most from our exclusive guests who visit us for an idyllic escape at the Sian Ka’an Village, Mexico is the humble charm and authenticity of our team. Managed by Margarita Zamora, who boasts extensive experience working with VIPs and celebrities in luxury hotels and cruise lines, the team works together like a family, complementing one another in harmony to offer the best service. However, during your stay at Sian Ka’an Village, two of the central figures you will meet or see around the property are Señora Alejandra and Señor Polo, a married couple with more than forty years living in the Sian Ka’an Biosphere. 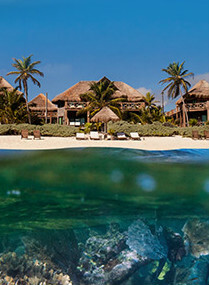 They will surely be able to tell you a thing of two about the Sian Ka’an Biosphere. Born Alejandra Alvarez May and Apolonio Alvarez Chi in Centenario, Campeche and Tiosuco, Quintana Roo respectively, Señora Alejandra and Señor Polo are integral to the smooth running of the Sian Ka’an Village. Together they hold a wealth of knowledge about the biosphere, having moved to the region in 1974 to work collecting coconuts during a time when the area was dedicated to the cultivation of coconut trees used to make coconut oil and soap, amongst other derivatives. The coconuts would be transported by sea in a sailing boat named Aguilucho which would collect 30 tons each month. The couple decided to stay and make a new life in Sian Ka’an, attracted by the tranquility and beauty of the biosphere as well as the employment opportunities. Their history together is a typical girl-next-door romance, falling in love when living as neighbours in Felipe Carrillo Puerto, Quintana Roo, where today, their children aged 29, 28, and 19 years old now live. 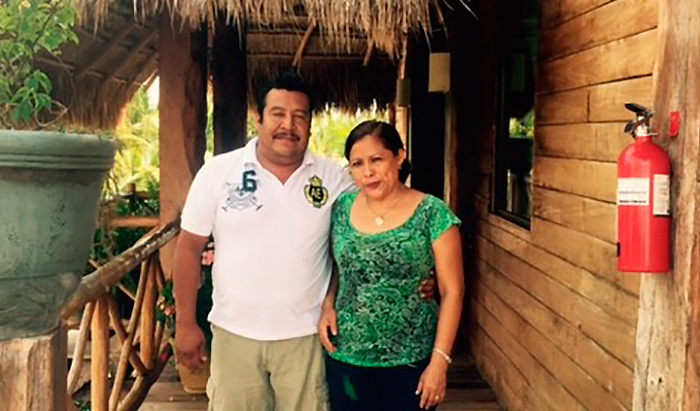 They became part of the Sian Ka’an Village team in 2003 before the property was even completed as Señor Polo helped to prepare the land for construction and Señora Alejandra prepared meals for the property’s owners. Quickly and easily earning the trust and affection of the owners, the couple have been a faithful addition to your experience of Sian Ka’an Village every since. On your next stay at Sian Ka’an Village, you will notice how they are the respectful eyes and ears of the property, ensuring that your experience here is peerless, safe and luxurious. You will surely meet Señora Alejandra as she takes care of your suites, while Señor Polo takes charge of the beach and gardens service, offering tours in his fishing boat for those seeking an adventure. Señor Polo is proud of his fishing boat, named Mosquiteros after the land he sold to purchase it in Felipe Carrillo Puerto. A born and bred seafarer who loves the excitement of the sea, Polo has spent all his life on the water and is a keen fisherman. The biggest catch of his life to date was a 220kg Goliath Grouper Fish in 1985. It is important to both Señora Alejandra and Señor Polo that guests take home with them special memories of their stay at Sian Ka’an Village, which is why everything they do is to make sure that each moment is unique and extraordinary in this slice of paradise they want you to call home too. Make sure you take time to meet the team and learn a little more about the Sian Ka’an Biosphere service when you come to stay.